Kansas governments are trying — again — to expand their powers to take property to the detriment of one of the fundamental rights of citizens: private property rights. Empty lots in northeast Wichita. Click for larger version. Senate Bill 338 appears to provide local governmental units with additional tools that they don’t need to “take” properties in a manner that circumvents the eminent domain statutes that private property rights advocates fought so hard to achieve in 2006. The total lack of compensation to the property owner for the deprivation or taking of his or her property is missing in the bill. Allowing a city or their third party take possession of vacant property they do not own and have not obtained legal title to is wrong. Please take a look at a comparison between a free-market private sector solution as contrasted to a government mandated program to achieving affordable housing and the impact highly subsidized government housing solutions are having on adjacent home owners. Of note, Todd and I, along with others, had a luncheon meeting with a Kansas Senator who voted for last year’s bill. When we told him of our opposition, he asked questions like, “Well, don’t you want to fight blight? What will cities do to fight blight without this bill?” When we listed and explained the many tools cities already have, he said that he hadn’t been told of these. This is evidence that this bill is not needed. It’s also evidence of the ways cities try to increase their powers at the expense of the rights of people. This quote is from an e-mail the Governor’s office issued in announcing his Veto of the 2016 bill (see copy attached). A “Message from the Governor” dated April 11, 2016 provides his excellent reasoning for the Veto, explaining, “The right to private property serves as a central pillar of the American constitutional tradition (see copy attached). Shortly after starting my career in the real estate business in 1976 I acquired my first rehab house. 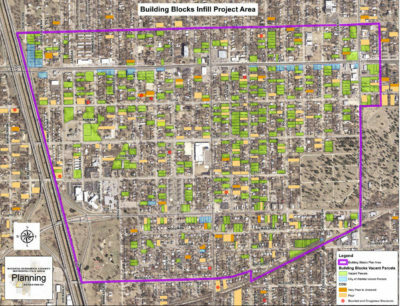 It was located in the Old Orchard area of Wichita that everyone considered one of the most economically challenged and difficult neighborhoods to work with in town. I paid the seller nearly $20 thousand her dilapidated house that included three vacant single family building lots. It cost me in the range of $10 thousand to rehabilitate the house that included repairing a caved in concrete block basement wall. I sold the rehabilitated house and the lot it was on for the $30 thousand I had invested in the transaction and wound up with the vacant lots free and clear. I sold the three lots to a builder for $9 thousand cash and he subsequently built three new affordable entry level homes on them. The seller of the house received cash for her property through a mutually agreed upon transaction without coercion (no eminent domain) involved. I rehabilitated the house and sold it to a young couple for their first home. The builder who purchased the 3 vacant lots built three new houses that he sold to owner occupant homeowners. The builder provided construction jobs and purchased building materials from local vendors. The Orchard neighborhood saw immediate improvement and felt the benefits of economic uplift. The City, County, and School District tax base was expanded providing with one rehabilitated and three new houses thus providing additional tax revenue to fund fire, police, public safety, and money to educate our children. I paid Federal and state taxes on the profit I made in the transaction and I suspect the builder did too. There was no need for government subsidies of any nature for this private sector transaction to work. Now in contrast, let’s take a look at how our local government has been handling similar neighborhood opportunities. Please take a look at the attached Building Blocks Infill Project Area map to discover what has been happening in a predominantly African American neighborhood community in Wichita. 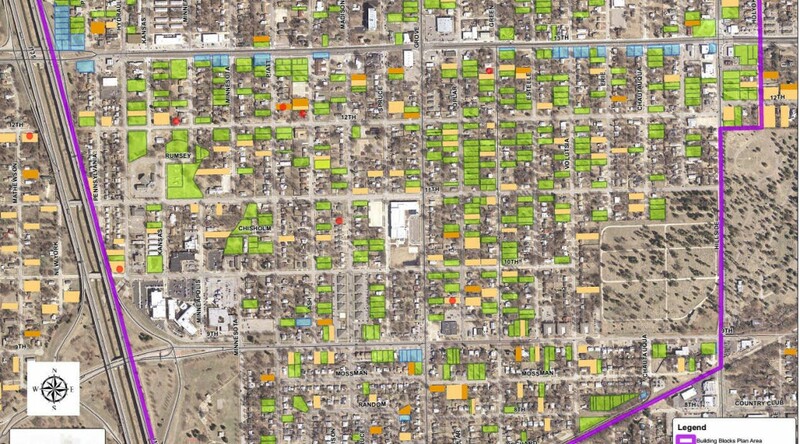 The vacant green rectangles are dozens of vacant lots where houses once stood that were bulldozed by the city. The city charged the property owner $8 – $10 thousand for bulldozing charges leaving the owner with a vacant lot that was left to produce high weeds and collect trash. Most of the owners let their vacant lots go back for taxes and many were sold for $100 or less and they received $0 for their properties. Thus the existing and potential tax base was lost as well as the wonderful opportunity for clean low-cost affordable entry level home ownership that is part of the American dream. Some of the most vulnerable and economically challenged property owners of our city rightly feel helpless in the face of this devastation. Now local governmental officials are asking you for additional powers through Senate Bill No. 31 to “deal” with this problem. They want the power to seize unoccupied houses without compensating the owners anything for their property. They want to empower non-profit (non-taxpaying) organizations of their choice to seize unoccupied houses without compensating the owners for their property. The non-profits involved in the redevelopment of this neighborhood community with the exception of Habitat for Humanity rely heavily on tax subsidies for wealthy taxpayers and generous Federal subsidies in the range of $50 thousand for each house built and sold. I hear talk of Tax Increment Financing (TIF) to finance redevelopment in this community. The TIF program is simply a diversion of tax revenue that needs to go to city, county, and school district treasuries and not flow back to developers. I see nothing in Senate Bill No. 31 that does anything to promote private sector redevelopment. Is there a private sector solution? I say YES and I see it happening. Private sector investors, contractors and homeowners are stepping up and seizing opportunity (See Exhibit B). This economic uplift is healthy for the neighborhood community, expands the tax base, and offers an opportunity for investor/contractor profit in some cases or low-cost affordable home homeownership in others. The rehabilitation of existing houses and redevelopment on vacant “infill” is best achieved by the private sector and not by government planners or their favored non-profit entitles. I urge you to OPPOSE passage of Senate Bill No. 31! The exhibits referred to are available in pdf form. Click here. I am glad that there was a defender of property rights at the Kansas statehouse to defend against the taxpayer funded city lobbyist(s) pushing for my city powers to grab property. I wonder how the city council and mayor would react if the city was grabbing homes in their neighborhoods without any legal recourse? I suspect that they would change their tune quickly. Of course, grabbing property like this has been regularly exercised by big governments throughout history. Look at the communists in the Soviet Union, China, Cambodia, throughout the 20th century, look at the National Socialists in Berlin in the 1930’s, or look at Venezuela or Zimbabwe today.